Autumn Beach Clean Series 2016 Register Your Beaches Today! 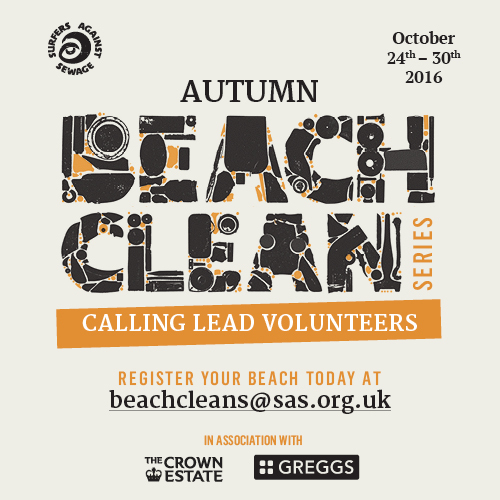 We are delighted to launch the 6th annual Autumn Beach Clean Series in association with The Crown Estate and Greggs. As summer draws to a close we are calling for 200 people, community groups, schools and local businesses across the UK to run their own beach cleans during the week of the 24th – 30th of October. Together these inspiring ‘Autumn Beach Clean Series Lead Volunteers’ provide their coastal community with the opportunity to protect their favourite beaches and to join a growing national movement calling for dramatic action to halt the marine litter crisis. Set to be the biggest Autumn Beach Clean Series ever, we expect over 4500 volunteers to join their local Lead Volunteers to sweep over 15 TONNES of marine litter from 200 beaches across the UK coastline from the 24th – 30th October. Over 100 of last year’s Lead Volunteers have already registered their Autumn Beach Cleans, so you’ll be joining a highly experienced volunteer army! 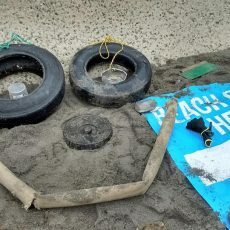 To register your beach clean, or if you’d just like a little more information on what it takes to be a Lead Volunteer head to the Autumn Beach Clean Series Home Page,. Marine litter is perhaps the most significant threat to our oceans today. It is an environmental problem on a global scale and adversely impacts wildlife, the economy and human health. Every stretch of coastline in every ocean is affected by marine litter, it is present through all layers of water, floating at the surface, suspended in the water column and of course, washed up on our beaches. There may be around 5.25 trillion macro and microplastic pieces floating in the open ocean – weighing up to 269,000 tonnes! (1) Recent studies show that there are well over 3,000 items of litter per KM of UK beach (2). Marine Litter is a man-made problem yet has detrimental impact on the environment and the wildlife that encounters it. At least 267 different marine species have suffered as a consequence of contact with marine litter (3). There is no doubt that more must be done by each and every one of us and SAS intend to lead from the front. Surfers Against Sewage are proud to be working with lead sponsors The Crown Estate for the 6th consecutive year. As manager of the UK seabed and around half the foreshore, The Crown Estate know that protecting and enhancing the coastal environment is crucial to the future of our wildlife and the sustainable development of this natural resource over the long term. It supports the Autumn Beach Clean Series through its stewardship programme, providing an important opportunity for people to play a part in protecting their favourite beaches and gain a lasting understanding of the marine environment. Although hugely inspiring, it’s now clear that the marine litter crisis cannot be solved by beach cleans alone. With this firmly in mind SAS are also delighted to welcome new Autumn Beach Clean Series lead sponsors Greggs. Their goal is of ‘having a positive impact on people’s lives’ is a perfect fit with SAS’s community engagement and empowerment ethos as they work to raise awareness of the fact that litter is an equal problem from streets to sea and affects the health and happiness of those who come into contact with it. 80% of marine litter originates from land based sources (3); however sad, this knowledge presents with us with an opportunity to tackle the problem before it even reaches our beaches. 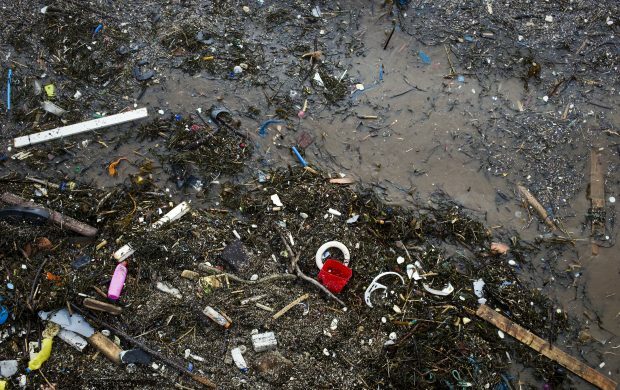 By changing behaviours, challenging manufacturing and underpinning change with strong legislation we can stop litter at source, trapping plastics within a circular economy not the environment SAS believe that reducing marine litter by 50% by the year 2020 is a realistic target. This is why circular economy messaging (4) and a commitment to recycle all plastic bottles removed from each of the 200 beaches will be at the very heart of the Autumn Beach Clean Series. Marine litter is threatening to overwhelm our beaches but YOU can make a difference! Register your Autumn Beach Clean TODAY at [email protected] or call 01872 553001. 5 incredible years of the Autumn Beach Clean Series has enabled almost 8500 amazing volunteers to remove over 25 TONNES of marine litter from 333 of our precious beaches, often braving extremely challenging weather. Our incredible Lead Volunteers are the driving force behind this and we can’t wait to welcome even more of them to the SAS family in 2016! We’re delighted to be supporting Surfers Against Sewage for another year to help protect and enhance our coastal environment, whilst also providing a great day out for people to support their favourite beaches. 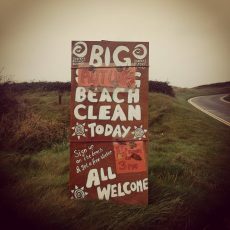 We are pleased to be working with Surfers Against Sewage on their Autumn Beach Clean Series and look forward to seeing the difference all of our volunteers can make to our wonderful coastline environment.